I ran across some information about some of the 2 jets that deals with the percolation of gas after shutting off the vehicle. We hear about this problem a lot these days because gas now has a lower boiling point. Percolation means that the gas is boiling resulting in a very strong fuel mixture. This can make a hard to start situation. I’m not sure if this was done on every 2 Jet, but it wouldn’t be hard to figure out if you have this feature just by looking at the throttle body (float bowl side). The purpose of throttle body venting is to give quicker hot engine starting after the engine had been shut down for a short period. During extreme hot engine operation the fuel in the carburetor tends to boil and vaporize due to engine heat. I said extreme, but gas now has a lower boiling point and it doesn’t take a lot of heat for percolation to happen. Some of the fuel vapor tends to reach the carburetor bores and condense on the throttle valves and seep into the engine manifold. By venting the area just above the throttle valves, hot engine starting time can be reduced to a minimum, on applications where the carburetor is exposed to extreme engine heat. There are 2 methods used in venting the throttle bore area. 1. A special throttle body to bowl gasket is used. See figure A. 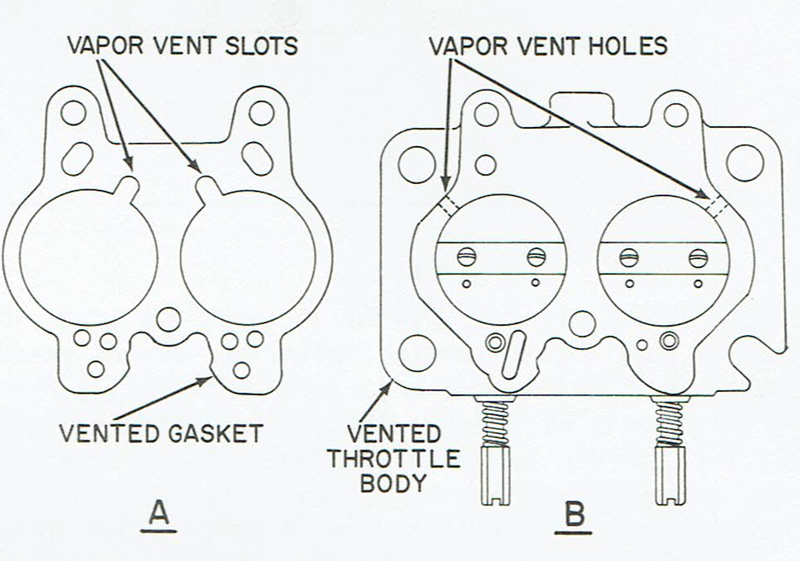 This gasket has cut-out areas which vent fuel vapors from the carburetor bores just above the throttle valves. 2. The other type of venting is accomplished by drilled holes through the throttle body casting just above the throttle valves. See figure B. They serve the same purpose as the vented gasket. The location of the vent holes are such that they will not disrupt engine idle or off idle operation. They are located above the throttle valves on the side opposite the mixture screws, in an area where the transfer from idle to main metering will not be affected. Now don’t go out and cut holes to create the vent holes if you don’t now have them. That isn’t going to work. You will most likely create a vacuum leak. You always have good information on carburetors, period.